Since all of the information telling us how harmful cigarettes are to our health more than half of confirmed smokers say that they want to quit smoking. 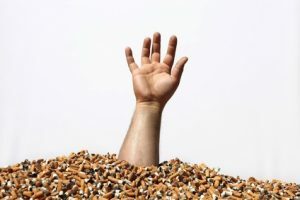 Almost all people who try to quit smoking agree that smoking cessation is one of the hardest things they have ever tried to do. E-cigs are reported to be very similar to smoking a regular cigarette, and they even have nicotine in the liquids so the smoker does not have to go completely cold turkey, but can they really help you to be successful in your attempt to stop smoking? E-Cigs are electronic cigarettes. They require a liquid to be placed in them and they vaporize that liquid as the person draws on the tube like they were drawing from a cigarette filter. When the vapour enters the person they get the same feeling that they get when they inhale tobacco smoke. The vapour is exhaled out of the lungs in the same way that tobacco smoke is exhaled from the lungs. The vapour exhaled from the body looks like ordinary smoke. Do you have Withdrawal Symptoms when you Use an E-Cig to Stop Smoking? One of the main reasons why electronic cigarettes help people to stop smoking is because the e-liquid that is vaporized has nicotine in it. The majority of people who are using these devices for the purpose of quitting smoking buy the full strength nicotine for a short time, and then they gradually reduce the amount of nicotine that they receive, until they are smoking vapour that contains no nicotine. Since you are getting the nicotine like you were used to there will not be withdrawal like you would have if you go cold turkey. Is it like Nicotine Gum? Nicotine gum is another method of smoke cessation that works for many people. The gum has nicotine in it to stop the withdrawal symptoms and people are supposed to gradually use less. E-Cigs are more successful at helping you to stop smoking because the nicotine in nicotine gum often causes blisters in the person’s mouth. The nicotine delivered through the vapour of an e-cig will not blister your mouth. Nicotine tastes bad. It is bitter and when it is put into the mouth there is no way to hide that bitter taste. The e-cig liquid has base liquids and flavours added that will mask the flavour of the nicotine. The majority of people who have used, or who are using e-cigs as part of their smoke cessation strategy say that the physical act of holding the device between their fingers helped them. Smoking is as much a physical habit as it is a chemical addiction. By having the electronic device to hold, and drawing in then exhaling smoke, the people say they felt more satisfied. Some people say that the simple act of holding the device between their fingers calmed some of their cravings. They also say that when they saw other people smoking the device it felt like a cigarette so they were less tempted to ask for a real one.